What it means: Any photo or graphic with lower than ideal resolution. Ideally, images for your magazine should be 300 dpi (dots per inch) at the size the image will print. Century Publishing will flag any image below 150 dpi as low resolution, as this is the point where low resolution begins to become noticeable. Sometimes image resolution is referred to in terms of ppi (pixels per inch) rather than dpi. In regards to image resolution, the terms dpi and ppi are interchangeable. Problems caused: Image quality will be less than ideal. Depending on the actual resolution, image quality may range from somewhat poor to extremely poor and jagged edges may be visible throughout the image. 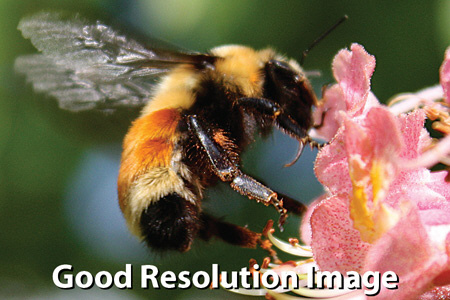 How to fix: If a higher resolution replacement image is available, it is recommended to replace the lower resolution image with the higher resolution image. Simply changing the resolution of a low resolution image will not noticeably improve the image quality. If the entire page or all images on the page are low res, it may be that the images were fine, but the wrong settings were used to generate the PDF that was uploaded. In this case, just export a new PDF of the page using the correct PDF export settings.